When adding a tool to EditPad Pro's Tools menu, there are three pages of settings that you can make for each tool. On the "Files" page you can choose if EditPad Pro should save the current file or selection, or open files modified by the tool. Mark "save the current file if it has unsaved changes" if EditPad Pro should automatically do a File|Save before the tool is run. If the file is untitled, you will be prompted for a file name. You can use the %FILE% path placeholder to pass the file on the tool's command line. Mark "save the current file into a new temporary file" if EditPad Pro should automatically do a File|Save Copy As and save the file under a new, temporary name before the tool is run. This is useful if the tool will modify the file's contents but you do not want to lose the original, or if you want to test changes you made to a file with a tool without having to save those changes first. The temporary file will be deleted after the tool has finished running. Mark "save the selected part of current file into a new temporary file" if EditPad Pro should automatically do a Block|Write before the tool is run. You can use this to allow the tool to read or modify the selection. You cannot use this option in combination with saving the entire file into a temporary file, but you can use it in combination with both "open temporary file" (see above) and "replace selection" (see below). The temporary file will be deleted after the tool has finished running. Turn on "reload the current file" to force EditPad Pro to reload the file that was active when you invoked the tool as soon as the tool has finished running. You should do so if the tool will modify the current file, even if you've turned on the option to reload modified files in the Open Files Preferences. Otherwise, EditPad Pro may not notice the file has changed until you switch between tabs in EditPad or between EditPad and another application. Mark "open the temporary file into a new tab" if the tool will create or modify the temporary file and you want to see the changes in EditPad. If this option is checked, EditPad will open the file into a new tab and then delete the temporary file from disk. If you want to save the tool's result, use File|Save As. You can select the file type that EditPad Pro should use for the file. Select "same as current file" if the tool doesn't output a specific file type. Mark "open the temporary file into the message panel" if the tool will create or modify the temporary file and you want to see the changes in a side panel in EditPad. If this option is checked, EditPad will open the file into the message panel and then delete the temporary file from disk. You can select the syntax coloring scheme that the message panel should use. This scheme can be a scheme that is not used by any file type. Mark "replace the file's contents with the (altered) contents of the temporary file" to make EditPad Pro delete all text in the active file and then do a Block|Insert File using the temporary file, after the tool has finished running. Mark "replace the selection with the (altered) contents of the temporary file" if EditPad Pro should automatically delete the current selection and do a Block|Insert File using the temporary file, after the tool has finished running. 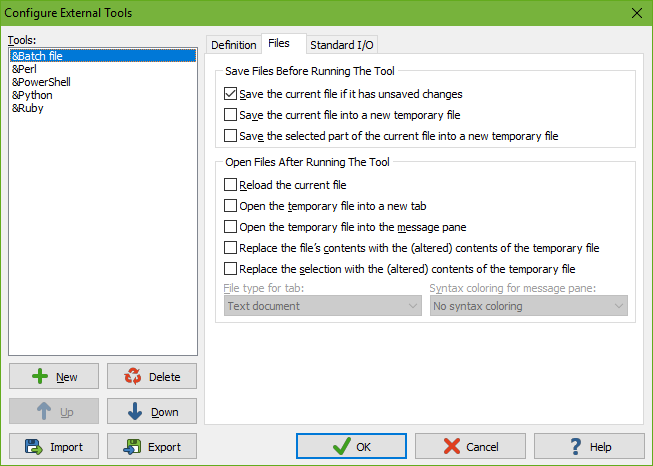 Together with the "save the selected part of current file into a new temporary file" option, you can add a tool to EditPad Pro's menu that modifies the current selection. You could write a script to add special functionality that EditPad Pro does not provide. If you've turned on at least one of the options to either open or save a temporary file, you can use the %TEMPFILE% path placeholder to pass the temporary file's name on the tool's command line. All of the options will work on a single temporary file for each tool.